For the second year, dozens of iconic buildings and landmarks around the country will turn orange in honor of Make Music Day! 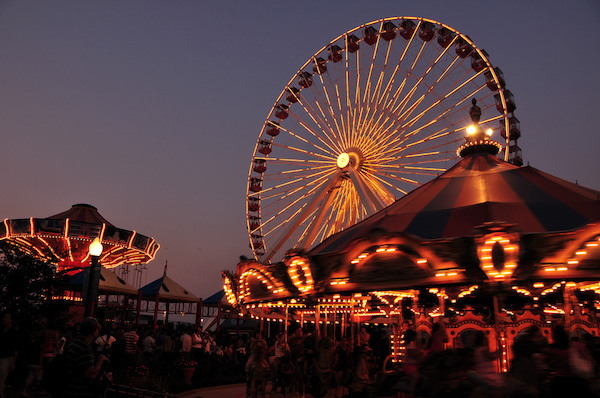 Eight bridges, four City Halls, and new landmarks including Chicago’s Navy Pier, Philadelphia’s Liberty Place, and Long Beach’s Convention Center will all participate by turning orange – evoking the sun, the start of summer, and the Make Music Day logo – on June 21 or the evening before. Another unusual landmark joins Make Music Day this year in the small Wisconsin town of Platteville. 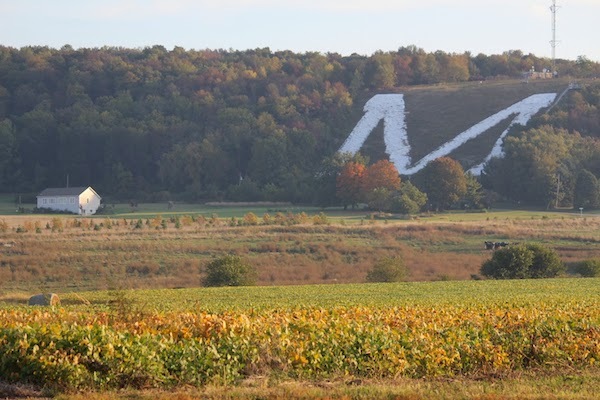 At June 21 on the Platte Mount M — the largest letter “M” in the world — bucket drummers, a drum circle, and junkyard percussion ensembles will play on each of the M’s 266 whitewashed granite steps, directed by Nancy Fairchild, the founder of Make Music Platteville. Everyone is invited and the local public library is even sponsoring a “make and take time” where children can make a percussion instrument to bring to the event! See Platteville’s full program on their website. It’s not just Platteville. People in cities around the country will come outside next week on Make Music Day for special bucket drumming workshops. In 27 cities, all percussionists who attend – kids and adults, professionals and first-timers – will be handed a pair of drum sticks generously donated by Vic Firth and invited to make music together. The events will range from structured classes to free-flowing bucket drumming circles, according to the concept of each local organizer. Explore the bucket drumming events! 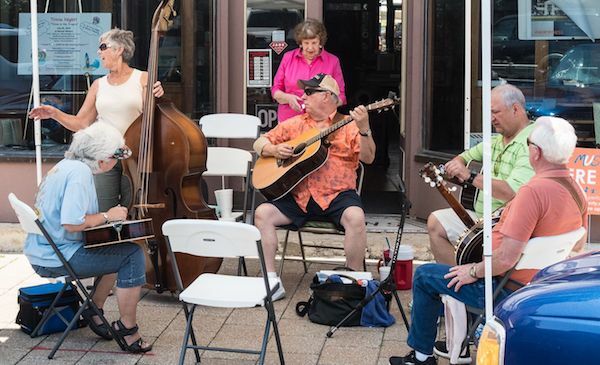 Liberty, Missouri is another small town (population 30,000) with an outsized Make Music Day celebration. Led by the Liberty Arts Commission, next week’s third annual Make Music Liberty features over 50 performances of all kinds including a bagpiper, a hammered dulcimer ensemble, an Elvis impersonator, and a 10 hour “all kids” musical extravaganza at the Corbin Theatre Company. Download the New Make Music App! See updates from your local Make Music chapter, share your own photos… and more! If you’re in New York City on June 21, free up space in your phone so you can download another app, too, and join the fifteenth annual Mp3 Experiment! Mp3 Experiments are free, participatory audio adventures created by Improv Everywhere. Attendees download a smartphone app and listen to synchronized secret instructions in a public space via headphones. Last June 21, over 3,000 people came to New York’s Battery Park and made music together with Boomwhackers. This year’s Experiment, once again part of Make Music New York, will be in Brooklyn Bridge Park, with a secret musical item generously donated to the first 1,000 participants by D’Addario to use in the event. Make Music Day all began in France with the Fête de la Musique. Starting as an initiative of the Ministry of Culture in 1982, the Fête de la Musique has become a nationwide musical holiday and a permanent part of the cultural calendar. On June 21 this year, follow the Ministry of Culture’s Fête de la Musique Facebook page for 24 hours of live footage from France and around the world! We’d like to take a moment to thank Sweetwater Sound for its multi-year Make Music Day sponsorship. Over the last four years Sweetwater has spread the word about Make Music Day to hundreds of thousands of customers, and has been the driving force behind Make Music Fort Wayne, bringing bands, play-alongs, and family fun to Friemann Square in their Indiana hometown on June 21. This year’s Make Music Fort Wayne is taking a year off (due to a date conflict with GearFest) but Sweetwater continues to join its customers in celebrating Make Music Day, and stands by to ship any last-minute gear that may be needed for June 21! Just outside of Rio de Janeiro, the Brazilian city of Niterói launches its first Make Music Day this year, with over 100 artists confirmed to make music all over town! Among many notable events in Niterói, a grand piano will be set up on the sidewalk outside the Municipal Theater and renowned classical pianists will play recitals for passersby. The city’s famous Museum of Contemporary Art will be lit up in orange to honor Make Music Day, in addition to hosting bands. Meanwhile, Brazil’s Anafima association is leading a national Make Music week from June 18-24, focused on learning and teaching musical instruments. No matter where you are in the country, Make Music Day is on its way to you! This year, one of Make Music Boston’s “anchor performances” takes place, appropriately enough, on the water. Inspired by the Charles River and Handel’s famous Water Music, fifty musicians (brass players, percussionists, and singers) will perform newly commissioned work by Marti Epstein, C. Neil Parsons, Maria Finkelmeier, Anthony Green, and Manuel Garcia Albornoz while standing along the Charles River Esplanade at sunset. Listeners will walk within and around the performers to create their own musical experience. 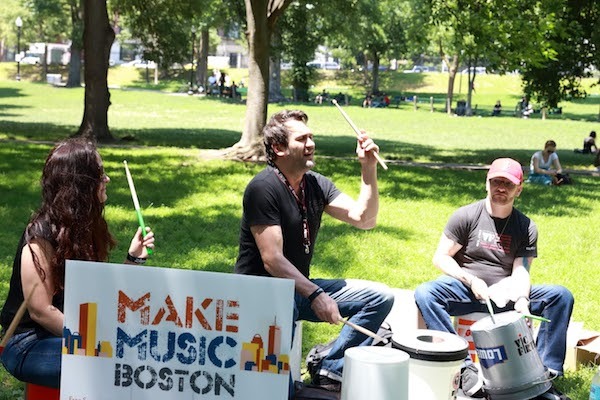 Learn more on the Make Music Boston website.